This section provides an overview of our techniques and research interests and lists some projects in the Host Microbes Interactions Lab. However, our research interests are constantly evolving and this list will never be completely up-to-date. The human intestine harbours the majority of the body’s microbes. This so-called microbiota has co-evolved with man to perform a number of beneficial functions; these extend beyond the gastrointestinal tract to influence host behaviour and mental health. Previously, we have identified the molecular mechanisms involved in the reprogramming of the intestinal mucosal immune responses to initiate and maintain a balanced immune response. The gradual development of the adaptive immune system appeared to follow a strong but transient hyper-induction of innate immune responses, including high-level production of antimicrobial peptides. Similarly, we revealed that only the establishment of a balanced microbial community could deplete high-energy metabolites and generate second-stage fermentation short chain fatty acids that can be efficiently metabolised by colonic epithelia. Furthermore, we showed that the microbiota strongly affects the glucose and energy metabolism of the proximal part of small intestine, namely, the jejunum. Unlike the other regions of the gut, the jejunum showed an instant response to the colonising microbiota, illustrating the unique acute role of this ‘forgotten’ region in the gut response to luminal microbe–diet interplay. Our findings identified an ‘insulin-response’ transcriptional signature for the jejunal metabolic changes in response to the microbiota that could actually help to find risk markers for declining insulin sensitivity, as seen in human type 2 diabetes mellitus. An additional insight from the temporal and spatial mucosal alterations during colonisation of the GF mouse intestine, was our finding indicating the response of the enteric nervous system to microbial colonization appears to be postponed during the process of microbial colonization until a microbiota-accommodating state of immune and metabolic homeostasis is established. Figure 1. Colonization of the gut microbiota launches complex communication networks with the host immune, metabolic and neuroendocrine systems, which ultimately impacts the overall wellbeing of the host organism. Therefore, to build on our existing knowledge of microbiota-host immune, metabolic anf neuroal cross-talk (summarized in Figure 1); we are currently focusing on unraveling the metabolic dialogue between the microbiota and its host gut-brain interphase (Figure 2). The metabolic dialogue between the microbiota and host cells involves small molecule signaling (metabolites, peptides and proteins). These signaling molecules, such as neuroactive chemicals, in particular neuro-amines, seem to play a key role in shuttling information between the host and its microbiota. We hypothesize that the gut microbiota can metabolize neuro-amines produced from the host and its diet to subsequently produce (neuroactive) metabolites, thus contribute to signaling to the host gut-brain axis. Figure 2. Metabolites of the microbiota are key part in the feedback loop, mediating of gene-environment interactions. Q1. Can the gut microbiota sense neuro-amines from the host? Q2. Can the gut microbiota metabolize these neuro-amines? Q3. Can the sensed/metabolized compounds singnal back to the host? Unravelling the metabolic dialog in the microbiota-gut-brain interphase will allow better understanding of the causative mechanisms whereby host-microbiota interactions occur physiologically and pathologically as in the case of anxiety, depression and neurodegenerative disorders (Parkinson’s, Alzeheimer’s, autism), all hallmarked by gastrointestinal abnormalities and rising rates in today's society. Figure 3. 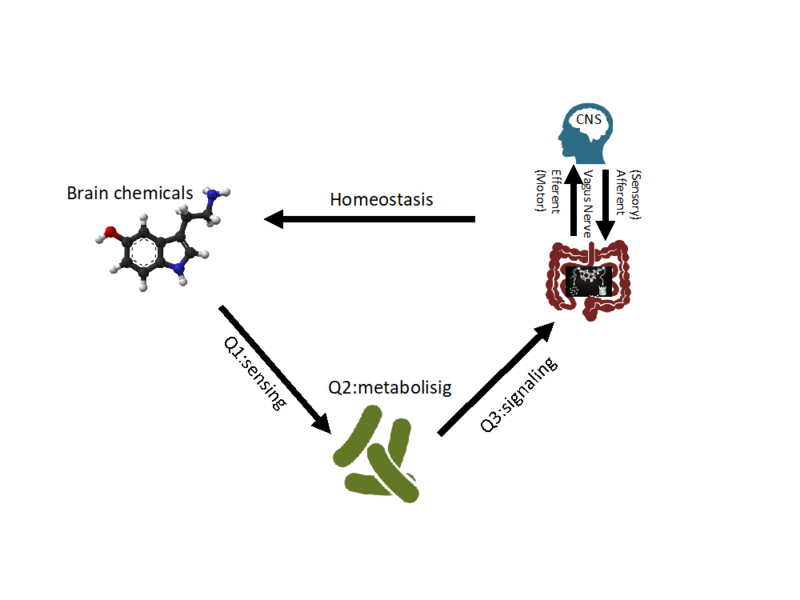 Research outline aiming to unravel the role of neuro-amines in the metabolic dialogue between gut microbiota and its host.